Parking is available either in street parking or in one of several lots throughout downtown Evanston. Meters are monitored from 9am-9pm Monday thru Saturday, and free on Sundays. Jason Heiman Executive Chef, AJ Francisco C.D.C. An American craft tavern featuring 32 craft beer and cider handles, a selection of craft cocktails, and a rotating menu of fresh, house made sausages and other selections. Friendly, casual, good list of draft beer, good bar food. I would like it even better with a few more food selections. Terrible experience. Drinks made wrong and not as requested twice. Food delivered to only some of the party. Another 20 minutes for the rest. Defensive attitude of staff. Bad PR. Our server, Luis was very friendly , personable and attentive. We ordered the steak and the duck blt. The steak was over cooked and tough and blt tasty but a bit too greasy. However, the pumpkin cake they gifted for my birthday was delicious! Overall a good experience but will just order cocktails and dessert next time. We went on a Friday night , our first table was under a blasting vent, our second table was by two loud groups, not unusual for a place like that on a Friday night. I think for this guest, I'll go back on a week night. The soup was fantastic, my date enjoyed all the beer choices and his meal. Our server was quick and thoughtful. Plenty of other items on the menu I want to try. Good drink selection and basic bar food (pretzel good, wings ok) but the pork tenderloin entree looked like a microwaved lean cuisine, and did not taste as good. Dry pork, canned corn on side, and incredibly over-flavored mashed potatoes. Come for the drinks, not the dinner. Great little spot! We went early to beat the crowd and the noise, but could be really fun if you like noise. :) Menu was small but that’s what I like, a few things done the right is the way to go! Met friends for dinner. There were four of us in a back booth . Much prefer the booth to the communal eating - they do not offer many booths - mostly communal dining or small tables right next to each other . Great variety of drink options . We all enjoyed our beers and cheese curds . I got a Chicago dog and fries - it was just average. Service was really good . Vibe was energetic - a little loud . We liked the cheese curds and fried pickles...Mac and Cheese was bland, otherwise food was just ok. Nothing special. 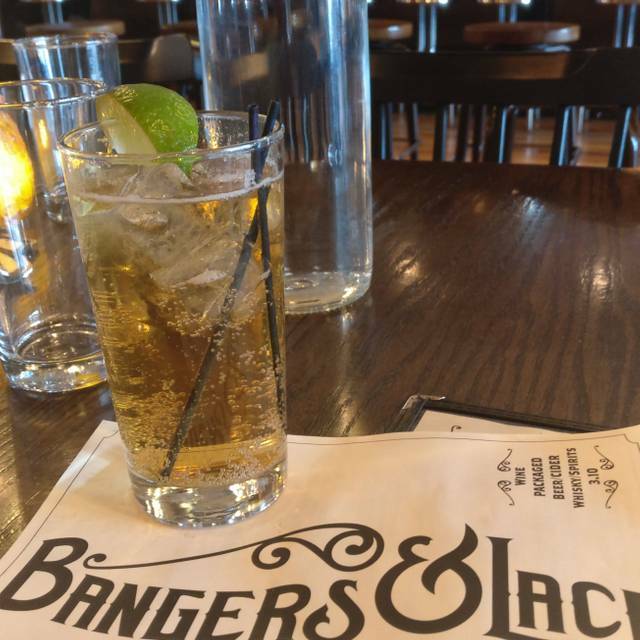 We frequently visit Bangers and Lace in Evanston. Always great food, great service and warm cozy ambiance. 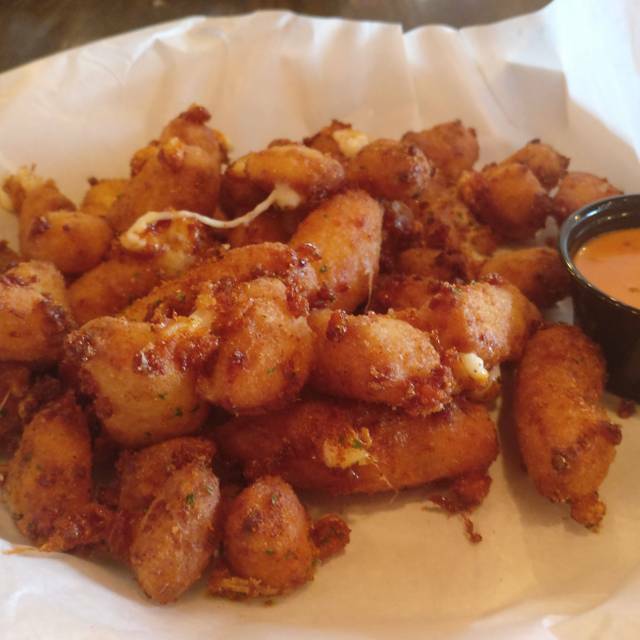 The cheese curds are wonderful! Enjoyed the fall shandy beverage. Always happy to dine here. We will return. We dine here pretty regularly. Always great food, and a warm and cozy atmosphere. It works well when we bring the little ones as it isn't a super quiet restaurant , so any noise the kids make goes unnoticed. The fish and chips, cheese curds and Texas Garlic sausage are my favorites. Others in our party loved the Steak Frites, and pork diablo. The hot dogs are always a hit with the kids! If you are looking for a fun beverage, the fall shandy is really good. My husband and the other guys take advantage of the large beer selection. We will definitely be back. We enjoyed our time there but did not fall in love. The decoration was really cool and inviting. Really good service. Great cocktails and ample tap beer selections. The food was OK. We had a 2 type charcuterie platter that was good but not great and not ample. The fish and chips were hand made and should have been good but there was something wrong with the batter that added a weird mushy layer. I saw a sausage platter go by that I almost ordered and it looked pretty skimpy. I will go back and enjoy cocktails , and skip the meal. As always great food, great service, relaxing atmosphere! Love the seasonal menus and beverages. There were 4 of us and we tried several appetizers, sandwiches and desserts. All were good but our favorites were the homemade cookies and milk and the warm pumpkin cake. We will be back! Looking forward to the new fall menu. Very good food, with the exception of an undercooked burger. This was made correctly after informing our server. Service was good. This place should work. But poor service, poorly educated staff, and mediocre delivery on food presentation - even in what should be core areas - undermines the experience. Excellent food and great spot. Service was awful but thankfully other servers did their best to pick up the slack for our supposed server. They succeeded. Everything was delicious! Highly recommend the cheese curds. Good place for drinks and small bites but definitely not a destination for the food. We ordered the cheese curds which were good (hard to go wrong there) but my crawfish andouille was terrible, barely ate half and I was starving. Husband had the Chicago dog, it was ok but again hard to go wrong with a hot dog. Nice ambiance and outdoor space. Friendly staff. Couldn't believe how expensive and awful the food was. $9 pretzel was amazingly horrible! The wings were also dry and extremely small for the price. Noticed most people around us didn't even finish their food either. Will not be back and do not recommend the food at all. The drinks are pricey for what they give but would only recommend to go here for a few drinks if you have no where else to go. Bangers and Lace Evanston customer service is awful. Went with a group of 6 friends. Server mixed up our drink orders the first time, brought one friend the wrong drink during the second round. We had to flag down our server after asking multiple other servers to help us. Later on in the evening, we see our server getting cozy at the bar with other people. It was an unpleasant experience having to work so hard to get our server's attention. If the gratuity is pre-set for a large party, we expect better service instead of a scam. Never returning to the Evanston location ever again. Great craft beer selections. Limited food options but some tasty items. Friendly service and pleasant surroundings. Awesome service. The blizzard is the best cocktail! I wish they had more food options but still a great spot to grab drinks and apps. So disappointed to see that they changed their menu to burgers and hot dogs. Unfortunately we won’t be back but still love the decor. Owners have changed direction towards more of a bar that serves food than a restaurant. Went in for a good meal as we have experienced in the past but was disappointed to find the menu has been stripped down to hotdogs and a few sandwiches, nothing exceptional. No salads available. Definitely seems to be more of a "necessary evil" menu as opposed to the great foodie experience we have had in the past. (The Steak Frites was amazing). It's an ok place now, would just grab a drink and go somewhere else if we were to return which is unfortunate. We had a lovely Valentine's dinner here this year and couldn't have been happier! The servers were all very friendly and helpful, and since it coincided with their half-price wine bottles night, we got a great deal on a Syrah. The kitchen even put a cute chocolate heart on our apple cobbler for the occasion, which I thought was very sweet. We loved the decor of the place. The service was great but it’s a limited menu which is more like small plates to share. The entrees are very small; again small plates. I would recommend it for drinks and small bites. Our server was inattentive and we had to keep running to the bar to ask her to take orders on next round of drinks. Our server added a 20% gratuity to our large group bill, and to smaller separate bills. We failed to notice that a gratuity had already been added, and added another 20% gratuity to the balance. Not only did our server not mention the oversight, which basically gave her over a 40% tip, but she closed out our bill. In addition, she added a 20% gratuity to smaller tabs that individuals had been running. When I returned to Bangers and Lace to point out the error, and emphasize that the server should have mentioned the double tip, I was told that "customers usually read their bills" and that the fault was mine. Disappointed that I can't recommend this because of the staff, because the space is quite nice. Was really looking forward to trying this place. Unfortunately we waited 10 minutes before someone came to the table and that was after alerting the host. After that the server, Jacquelyn H, rarely checked on us and just completely ignored us after dropping the check. The ambiance is great, just unfortunate the service was subpar. Our waitress did not know the food or drink menus well. When we asked her basic questions about menu items, she did not know the answer. She was also not helpful in providing information about the beer list. It's a great menu with lots of options, but the servers should have more knowledge about the beers and be able to help direct patrons. Had a nice Saturday date night here. We’ve been here a few times and it wasn’t too crowded so we were able to have a nice conversation. We did have to get the servers attention a few times but overall good experience and will be back. Very nice servers but greasy food. Maybe hood for drinks and apps but not a great place for breakfast. Hash had little flavor. Duck sausage blt was greasy. We had brunch at B&L. Poached eggs were perfectly done, potato pancakes made from scratch were delicious, fresh-squeezed grapefruit juice very fresh, kielbasa and sausage gravy (for the biscuits) were spicy and wonderful. Hearty food for a chilly day! Server was prompt, friendly, and attentive. Awesome and unique beer list - definitely recommend trying it out! Had a great time. The food was good, and the service was excellent. This was one of the best microbrew places I've been too. They have a wonderful craft beer selection as well as organic meal options. I had the carrot puree soup and it was super tasty. Their beer also isn't stupidly overpriced. Bangers & Lace was great. I went in with a group of friends on a Friday, our table was ready and waiting for us. The service was prompt, warm, and friendly. The beer list was extensive and everything we tried was great. I had the duck sausage and it was fabulous. The prices were quite reasonable for both the drinks and the food! Friendly informed & attentive staff on a relatively slow Sunday. Kid friendly in an on the fly/responsive way, since menus didn't list kid options or sodas. Music level a little loud for conversation but overall a good experience.